Dr. Yang's specialty is in image-guided intervention, multi-modality medical imaging, machine learning, as well as image registration and segmentation. 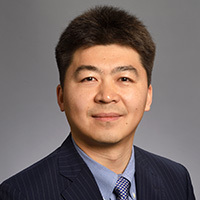 Xiaofeng Yang, PhD, is Assistant Professor of Medical Physics and director of the Medical Physics Residency Program in the Department of Radiation Oncology at Emory University School of Medicine. Dr. Yang's specialty is in image-guided intervention, multimodality medical imaging, machine learning, as well as image registration and segmentation. Dr. Yang is an active member of the International Society for Optics and Photonics, the American Association of Physicists in Medicine, American Society of Therapeutic Radiology and Oncology, the Radiological Society of North America as well as the American Brachytherapy Society. Dr. Yang received his BS, MS and PhD (finished his PhD training and thesis at Emory University) in biomedical engineering from Xi'an Jiaotong University in China. He completed his postdoctoral and medical physics residency training in the Department of Radiation Oncology at Emory University. The goal of Dr. Yang's work is to develop novel analytical and computational tools to enhance the role of quantitative imaging in cancer radiotherapy to improve the accuracy and precision of radiation therapy. His research has put emphasis on applying multimodality imaging for cancer radiotherapy with a focus on prostate cancer. His current research projects include image-guided radiotherapy (brachytherapy), MRI-based treatment planning, quantitative imaging biomarker development, advanced image analysis algorithm development and clinical applications. In his laboratory, Dr. Yang enjoys mentoring undergraduate and graduate students, postdoctoral fellows and residents in imaging research. Dr. Yang has served as a principal investigator of National Institutes of Health (NIH R01), Department of Defense, and institutional pilot grants.